Strategic Auction Alliance provides complete tax title assignment auction services to Massachusetts municipalities. Massachusetts tax title auctions are similar to what many people refer to as tax lien auctions or tax deed auctions in other states. Our programs are designed to deliver capable and interested third party investors who assume the municipality’s “receivable position” and purchase tax titles for the entire amount due the tax title accounts and settle with the municipality within 14 days following the auction. We keep the process simple and navigate you through the red tape. No guess work, no worrying about compliance, we have it covered. We make your auction event easy from start to finish right down to sending the certified US mail notices, communicating directly with the investors, collecting the earnest deposits in escrow and delivering to our municipal clientele up to date assignment documents for their usage. Need more help? No problem… we have a CMMC/ CMMT tax title specialist on staff that can assist with your pre and post auction tasks. We offer immediate results without the time and expense of tax foreclosure. 16% accruing interest upon the principal tax title balance is an attractive investment mechanism in today’s economy. We offer investors the opportunity to bid competitively in a completely transparent open forum for these assets, resulting in the assignment of the entire amount due the municipality at a minimum or that amount plus a premium if the desirability for any given asset so dictates. All of our tax title assignment auctions offer online absentee and / or simulcast streaming real time auction capabilities to offer remote bidding to buyers who may not wish to attend in person expanding our auctions to a wider audience of participant buyers. Recently, we have conducted auctions for the Town of Weymouth, MA and the city of Quincy MA Weymouth realized a return of over $900,000 in their first auction! A subsequent second auction contract with the Town of Weymouth returned an additional $800,000. The City of Quincy MA to realized a return of $700,000 in their most recent tax title auction. Cultivation of a specialized, targeted marketing campaign –We go above and beyond to find buyers who are interested, capable and motivated to purchase your tax titles. From detailed property information packages to leveraging online communications, we offer a variety of marketing services that entice and encourage interested buyers. The Auction itself – Remote bidding opens the process to a national audience of investors. 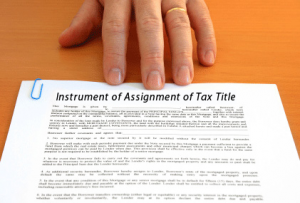 Individual tax titles are offered at auction. Minimum bids are equal to the municipality’s entire debt for each tax title. Once the title is sold, winning bidders close within 14 days. Properties remaining unredeemed or unsold can be foreclosed upon, with confidence, as a remaining option– Subsequent to tax foreclosure judgment; the property becomes a tax possession and can be sold by the municipality at auction or by RFP. Develop strategies for all of your tax title, tax possession and surplus properties and SELL them. Contact us today for a free consultation to address your specific tax title needs.